I don't think I need remind you that blogging is not just an act of fun but also a business that has and still getting alot of people employed. There are many mistake bloggers make that can cost them a lot of money, audience, recognition and deprive them of many amazing enjoyments. But in this article, I will only be mentioning 7 of them. 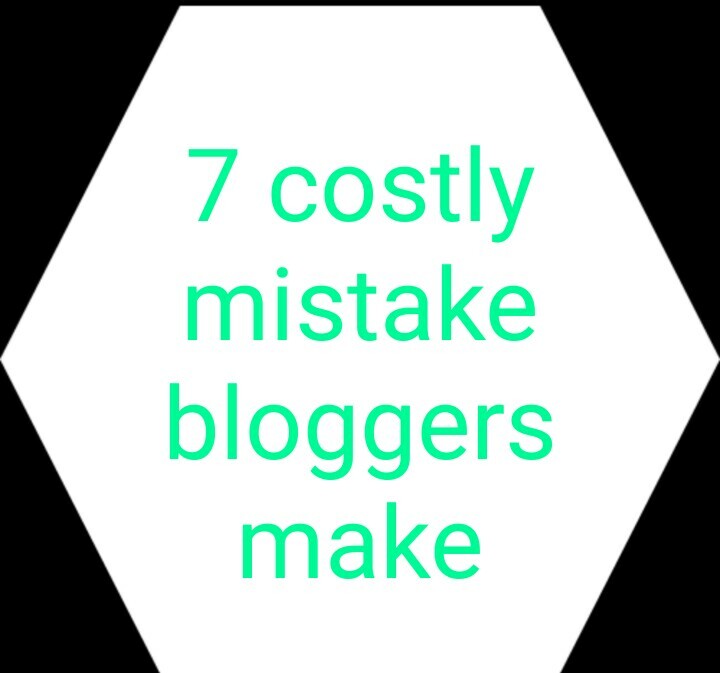 Every blogger strives to get recognition, money and post traffics but the following mistake will not make you get any of this things and infact will make you quit blogging if made. As a Christian that I am, I believe that God should be put in front of everything but there are certain mistake you must correct for the sake of your blogging career. 1. Bogging Because Others Are Blogging: this is very common to newbie bloggers and some old too. Many just venture into blogging after seeing some people get wealthy from it, so, they think blogging is the easiest way to prosperity. Linda I. Ikeji is a notable personality in the blogging world both in Nigeria and abroad, she bought an house worth N500,000,000 some years back and ever since then, the rate at which people are rushing to be a blogger is very alarming, they are of the illusion that it is the fastest way to wealth. But they are mistaking and are now friends with failure because of this. 2. Not Wanting To Invest Any Money On Your Blog: its kind of stupidly funny when you encounter some so called blogger that wanna be successful at blogging without wanting to invest money on their blog. Don't you know "You can only make money using money". Many don't want to invest (money) in blogging but they want to be prosperous at it of which it is not possible. Its kind of embarrassing to see a blogger still using a sub-domain on his/her blog (e.g www. yourUrl.blogspot.com) despite this embarrassing fact, such a blogger will still be happy to share his/her blog post on social media. Aren't you ashamed? How much is a domain name that you cannot buy? This is a mistake you must correct or you quit blogging. 3. Not Wanting To Invest Time: how can you be successful in the blogging community without investing alot of time on your blog? Over the years, people that are successful in blogging are people that invested their time in it. For example let's take a look at the founder of the Africa's largest online forum, Nairaland, Seun Osewa. Seun is a young man who quitted school just to focus and dedicate is time to blogging. I am not telling you to quit study. No. What I'm saying is that " your blog needs your time". Linda Ikeji most of you are a fan of today quitted modeling just to dedicate time to her blog. Jide Ogunsanya of the ogbonge blog (my very own mentor in blogging) after finishing from the university ventured into full-time blogging and now all the names mentioned above are prosperous and successful at blogging because they dedicated time to it. Start dedicating your time today! 4. Not Setting Goals: I believe before venturing into blogging, one must have a goal. What is your goal? Are you blogging because others are? Or you are there to make impact. You only blog for nothing when you don't have a goal. Its not too late to set one. Start today! 5. Not Being Unique as a blogger: I can't imagine a blogger begging for post views, ad clicks, copying posts from another blogger. It is bad. That is not the definition of uniqueness. No one is ever successful at that. Not being unique is a terrible mistake bloggers make that can cost them everything. Be unique as a blogger, stand out and be different. 6. No Formal Or Informal Education Before Starting A Blog: You as a blogger should endeavor to get at least little education before venturing into blogging and more education while in the blogging world because tech bloggers (like us) will only make alot of money from you ( by offering our services) when you don't know how to do anything on your blog. 7. Setting Your Mind Only On The Colorful Part Of Blogging: you will never be prosperous at blogging if you only think all moments are colorful. Expect tough and challenging moments in blogging and work to overcome them. Let me just add this. "Get yourself a mentor"
If you avoid or correct the above stated mistakes, I'm certain you're gonna make it in the blogging world. Thanks for allowing me share with you the secrets to a successful blogging. Use the share button if you love it!